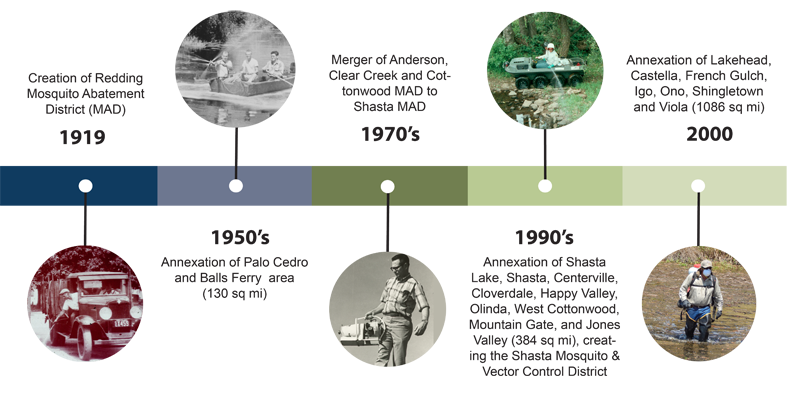 The origins of Shasta Mosquito and Vector Control begin in 1919 when, in response to endemic malaria, the Redding Mosquito Abatement District was established. This was soon followed by the formation of several mosquito abatement districts; including Anderson, Clear Creek, and Cottonwood.During the 1950s these districts consolidated to create the Shasta Mosquito Abatement District. Three further annexations occurred between 1970-2000, expanding the District boundaries from 48 square miles to 384 square miles. In 1994, the District changed its name to Shasta Mosquito and Vector Control District to better represent the services provided. Most recently, the District annexed an additional 700 square miles, to bring the District boundaries to approximately 1,086 square miles in Shasta County. Please use the area map's Search feature to locate your property. If your property is highlighted in green, you are within the Shasta MVCD boundaries.